I was living the runner’s dream, training in one of Americas most beloved running hubs: Portland, Oregon. It is easy to understand why so many great runners make this city their home. Nestled in the picturesque Pacific Northwest, Portland conjures images of towering Douglas Firs as prevalent as the multitude of runners cruising the city parks, grinding out repeats on the track, or logging long, controlled miles along the beautiful waterfront. I was working in my field as an archaeologist and art conservation assistant, putting in many a rainy mile, enjoying the thriving brewpub scene with my closest friends, and testing prototype shoes for Nike World Headquarters. Things were, effectively, great. It was after my last race, a victory in the inaugural Foot Traffic Hop Hop Half Marathon, that the incident occurred–one that resides in every runner’s darkest nightmares: I was injured. A stress fracture in my 5th left Metatarsal left me hobbling and sidelined from an expected breakthrough summer of racing. I was shattered. Any runner will tell you that they are not themselves when they can’t run and I was feeling lost. Ironically, the sudden monopoly of free time saw me lazing about, contemplating…well, time! The time wasted in so much training, only to be injured. The time spent dreaming of my future instead of living it. The time wasted eating junk food while watching every single episode of Survivor over 28 seasons. My life was in a lull. I was struggling with the desire to travel and the necessity of graduate school. Having been out of undergrad for 3 years, I had been consistently boosting my resumé with internships and crucial work experience, but seeing many of my peers graduating from Masters programs left me feeling behind ‘schedule.’ As with most competitive athletes, I constantly sought improvements and lacking forward motion was stifling my very being. Far too many people get locked into careers and family life, putting off their plans to travel for when they have the extra time and money. The logistics of taking time off work, balancing a home mortgage, seeing to the needs of children, and still managing to keep a social life make traveling improbable and traveling long-term nearly impossible. Many of these folks end up looking back later in life wishing they had seen and done more while they were young and carefree. I had no plans of being one of those people. So with nothing but a great job, a great community, and time with my family to lose, I chose to travel. Since leaving that refreshing running Mecca months ago, I have had the privilege of touring many great cities along my worldwide route. Honolulu, Nadi, Auckland, Sydney, Brisbane, Hobart, Cairns, Melbourne, and so many great towns in between had become my training grounds. I found my forward motion and the new surroundings seemed to accelerate my recovery. No longer driven by numbers, I listened to my body and simply enjoyed the run. 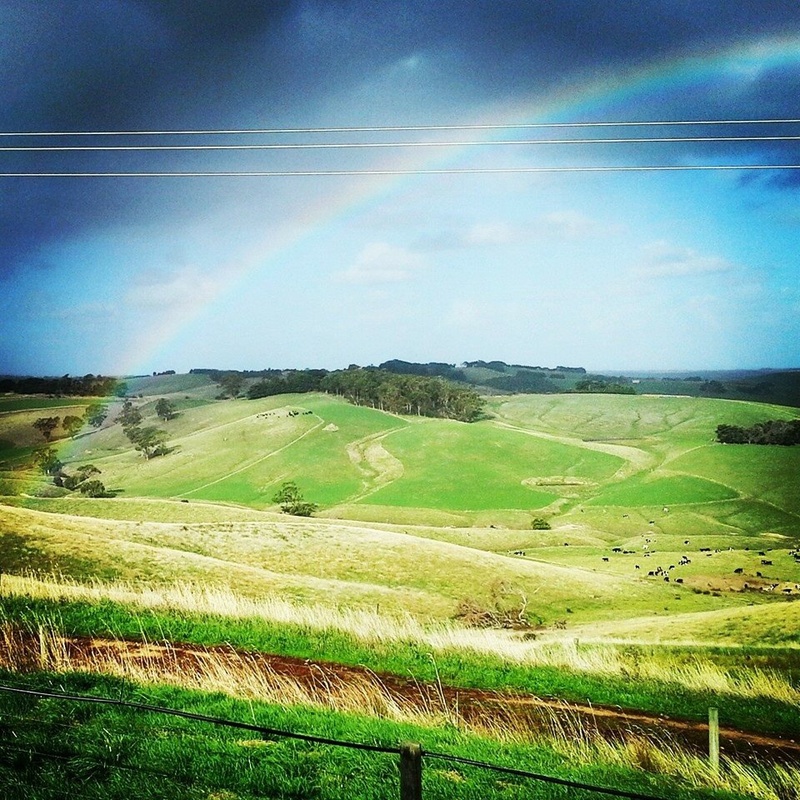 The Hills of Wonthaggi, Victoria, Australia. I now find myself in Australia, comfortably housesitting a property in the country around Wonthaggi, Victoria, rent-free. The running is terrific. The surrounding hills are formidable, and I draw strength from each one I summit. The air is crisp, the farmers friendly, and the roads nearly vacant to my benefit. I have joined a club of country hopping, long distance harriers and each week of training brings me closer to my goal of qualifying for the 2016 US Olympic Trials. Injury-free, and with countless other inspiring cities on the horizon, I plan this year of racing based on my intended journey: New Zealand, Malaysia, Cambodia, Turkey, Greece, Spain, Portugal, Morocco…and the list goes on and on. And for every country I long to visit there is a race waiting to be conquered. Running in a new setting, albeit another country, can do wonders to improve your motivations to train hard and run consistently. The runner sees and appreciates all that goes unnoticed by the speedy motorist and the true essence of a culture can be sought out on those back country roads, the uncrowded city bike trails, and the moonlit oval of the local track. I have connected more with a community through its weekend 5k than many people do in an entire holiday visiting the sites. Click here for the full list of great international races for 2014. I concur! Great post. Running shoes are being put on as I type this! Thanks for reading! Stay tuned for upcoming posts on travels, training advice, coaches input, and ‘flashback’ travel narratives. Do you by chance know if races like 5ks or 10ks are a thing in China? I’m trying to find something around Shanghai, but I am not really having any luck. Yeah, running is huge in China. Check out your local Parkrun. They usually go off every Saturday and are typically free to enter.